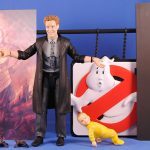 We celebrated Halloween last year with DST's series of Ghostbusters toys, and the full first five series' which constructed the amazing rooftop diorama! 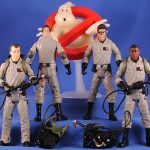 Well, fortunately the line has done well enough that they have continued into Ghostbusters 2, and have plans to wrap up with Real Ghostbusters! 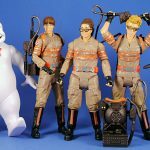 So let's take a look at Series 6 and 7 of the Ghostbusters line as well as some Mattel stuff I only just recently got around to opening. Happy Halloween, all ya'll - it's a Ghostbusters-a-thon!!! I picked up these three figures at Toys R Us when they first showed up but I couldn't decide if I really actually wanted them... but then TRU shut down and made that decision for me. Being a fan of the line I was looking forward to these figures but I was pretty disappointed to find that this was a straight repaint of the Ray figure with only a Santa Hat as a new inclusion. I suppose that's to be expected but it's just not a very appealing release OR way to state off the new line/theme. I mean, they DID exclude the weird thigh hose since that wasn't present on the gray suits, but then they just left the connector on him... so now Ray just has a weird nozzle on his left thigh, like he's been "tapped" to collect his Ray Syrup. It's just a bummer... I wasn't expecting to be dazzled or anything but this whole series is just kind of "okay" and that nonplussed-ness is led by Ray here. Louis is ultimately the most "exciting" figure in the series since he's something Mattel never made. 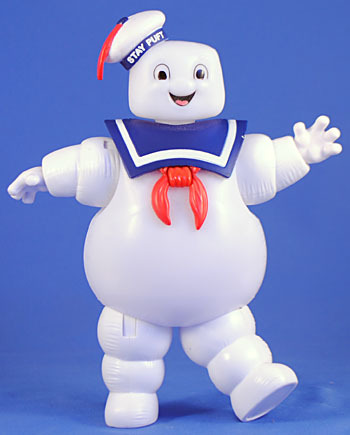 Buuuut he's still just another guy in a standard Ghostbuster outfit. It wasn't until I opened this and the next series that I realized that he is all-new tooling and appropriately much smaller than the other guys. That's pretty fantastic of them to do, I just wish it was "clearer" somehow while in package or that he had some extra accessories or something (like if the earmuffs were removable for instance) to further differentiate himself out some more. 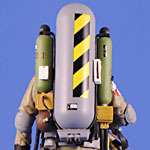 His diminutive size is also apparent when looking at his Proton Pack, whose belt strap is pretty loose on him. It's fine though and he does get a couple extra hands to assist in posing and holding. In context of the series this is a pretty great addition to the collection (despite looking like "just a new head" when in package). We were all waiting for this guy! And he turned out okay. The sculpt is expectedly better than the Mattel one, and there's a bit more paint and articulation - but that's it's. No accessories. 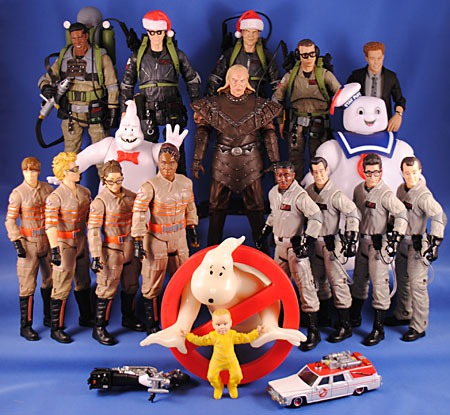 Granted Vigo doesn't really do much, but especially given the rest of the line, and even the Gozer figure, I thought there would at least be some alternate hands or an alternate head. Heck, he doesn't even include his painting! (And being DST I half-expected them to actually make the bit of wall and skulls in the painting a physical base for him.) I'm sure there are good reasons, but given how loaded the rest of the figures and line have been, this guy just feels empty. 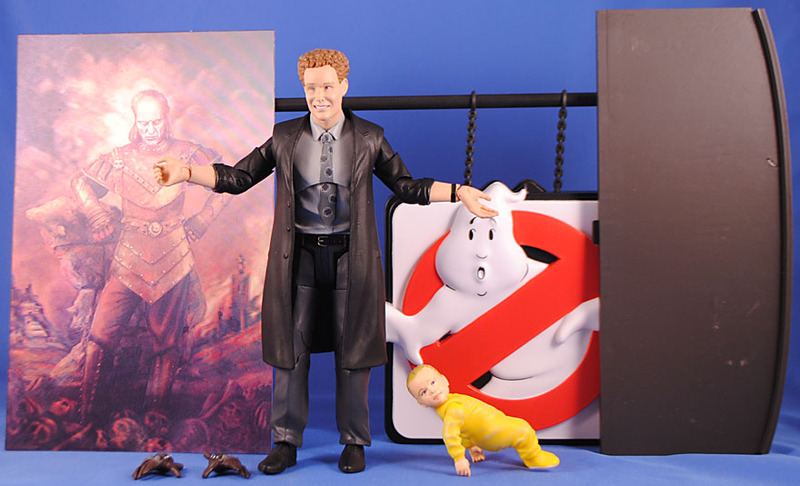 I have no interest the Build-A-Diorama firehouse facade so I was hoping to stick with the cheaper TRU figures, but I was debating about getting the Select version of Vigo just to get the logo sign. But... yeah. There's no point to having two Vigos. Now THIS is what I was expecting from the GB2 figures! 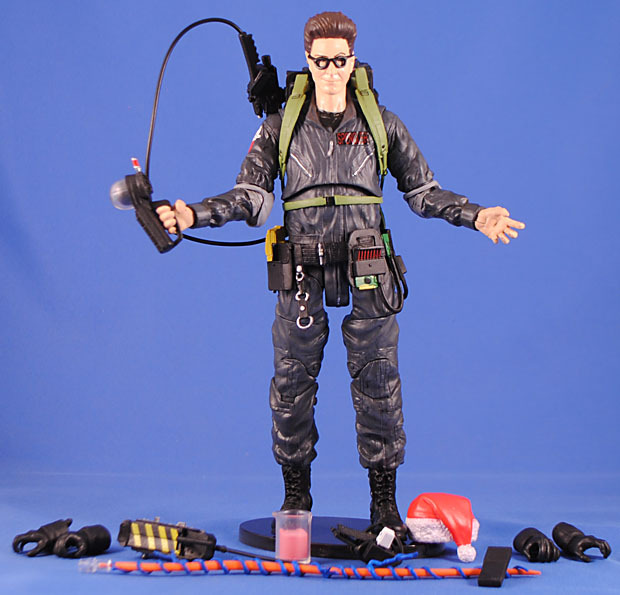 Egon is essentially a repaint of his GB1 figure but here they HAVE retooled his left thigh to NOT have the hose-spigot thing. 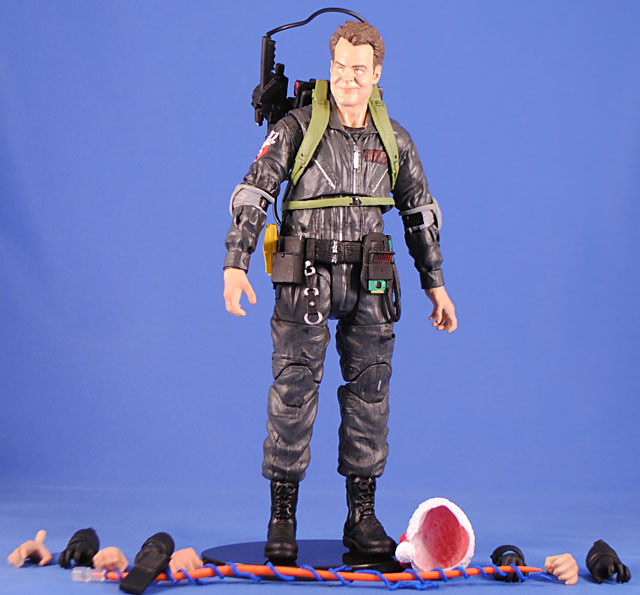 He comes with the proton pack and stream, and then two sets of alternate gloved hands. He also gets a ghost trap, which can plug in to his belt. Then, in the "all-new" category he comes with a beaker of pink slime (the slime is actually a separate piece glued in allowing for a very realistic look), his handheld slime sensor and a Santa hat - and DST is even tooling the Santa hats uniquely to fit the different hairstyles best; that's unexpected and cool of them! 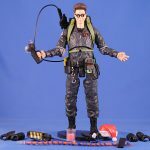 Egon is basically a simple repaint but he has a couple new pieces that really help him feel new and different (unlike Ray)! I really wanted the TRU versions of these figures since they were $10 less than the Select versions but was worried they wouldn't happen given TRU's implosion. Apparently, DST did make the figures on the cards but then sold them to other vendors, so I actually ended up having to order these from some web store but I'm just happy to have saved the money! Yeah, yeah, yeah!!! 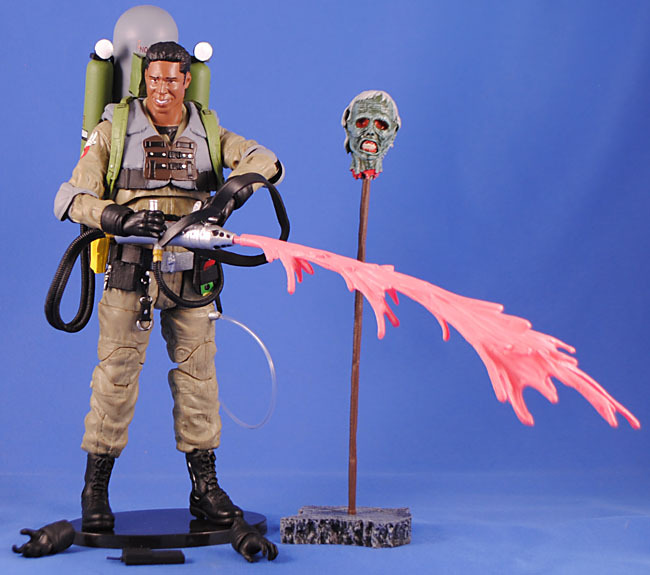 The slime blowers are surprisingly cool looking and it's great to finally be getting toys of them, and this is much better than the Mattel version! He has the basic GB1 body but a new GB2 head, with a passable likeness under a thick coat of glossy paint. 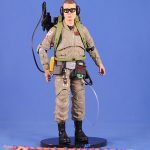 The blower and vest are a separate piece over the torso so in theory it's removable like the proton packs. The blower gear and tanks look phenomenal and are just super cool - DST did a great job on this backpack! The spray gun is neat but it's pretty weirdly held due to its dual hoses but the real problem is that the handles are too small to fit the hands (which also look weird and sculpturally "off")... classic. So basically you're just relying on fingertips and balance to hold the gun in place. There's also a giant slime spray that plugs in to the front, and despite its weight it actually seems to stay up reasonably well (or at least in short bursts [no pun intended]). And all of this is plenty to warrant this being a really nice release, but THEN they also included one of the severed heads from the subway sequence! Since there were so many heads in the scene it's a bummer there's only one here but hopefully they include a couple more with the "We're Back" Winston in series 8. So far, this is the best of the GB2 figures for me. Janosz! 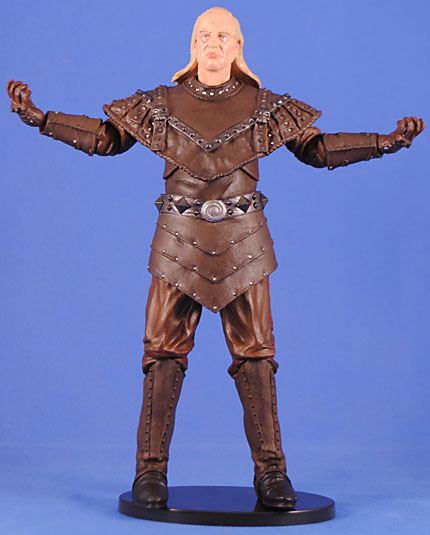 This character was my introduction to the actor Peter MacNicol (the Dragonslayer!) 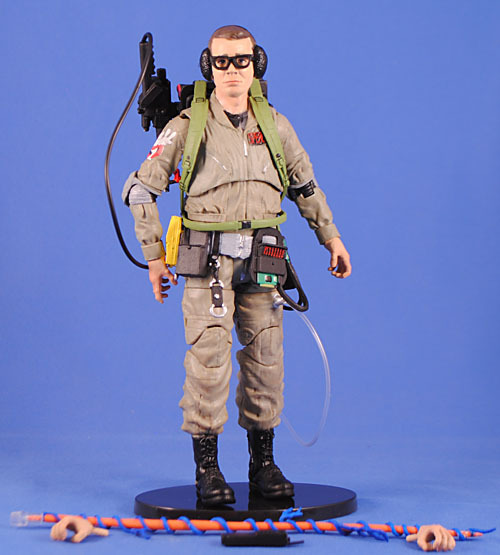 and he is such an indelible part of Ghostbusters 2 that he was definitely a hole in the Mattel collection so it's awesome to get him from DST! He is exclusive the premium Select version of the line (presumably since TRU couldn't shift the supporting characters from GB1 to save their life, unfortunately. So the third figure in the carded series was a translucent Terror Dog, for some weird reason). Janosz is pretty well sculpted but the joints, especially the elbows, can be pretty restricted in movement and it's absolutely insane to me that they sculpted the tie on and split it across an articulation cut.... WTF, mate!! And I thought Quitting Time Ray was weird; this is just a really weird, really poor choice and I'd 100% rather not have the torso joint than have the tie like this. But, such is the bizarre world of DST. This figure is also loaded with accessories! 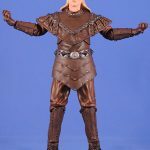 He comes with baby Oscar, who even has a swivel head joint and balljointed shoulders, plus two alternate hands for Vigo allowing him to hold Oscar, and then, or course, the painting of Vigo. Annoyingly it's another lenticular thing allowing Vigo to disappear and reappear, and while the effect is shockingly good here (way better than Mattel's) I still would really prefer to have two printed versions to make for a better and more accurate display! Being that this is the Select line, Janosz also includes not one but two pieces of the build-a-firehouse! The obvious and best of them is the logo sign from the first movie - it looks great and I love that DST released it as well as the GB2 version, giving collectors a choice of which movie the facade can represent. Since I'm not building the facade I still appreciate it as a cool display logo I can use on the shelf (which why I'm also drawn the the GB2 one that comes with Vigo). The second piece is a weird big gray rectangle which I think is for above the doors. At any rate, overall this is a pretty cool figure and worth the $25. So the 2016 Ghostbusters was a hell of a mess and seems largely forgotten two years later. It was aimless fun, which is more than enough for some people so I can't really begrudge them their entertainment/distraction while eating popcorn; BUT for a big fan of the original movies it was so disappointing and heartbreaking to see that this movie almost intentionally ignored anything that made the original/s beloved/classics and really just stuck, true to Paul Feig's form, to the superficial. Gone was any genuine sense of realism, that grounded the original and its fantastical elements. It was just another generic improv comedy that just made up the jokes as it went along (in this scene, the proto streams lasso the ghosts, in this scene the proton streams explode the ghosts... wait, what?). 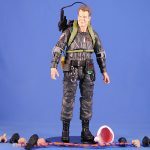 The cast is the least of the film's problems, and that cast, to transition to the matter at hand, is captured adequately here in action figure form. 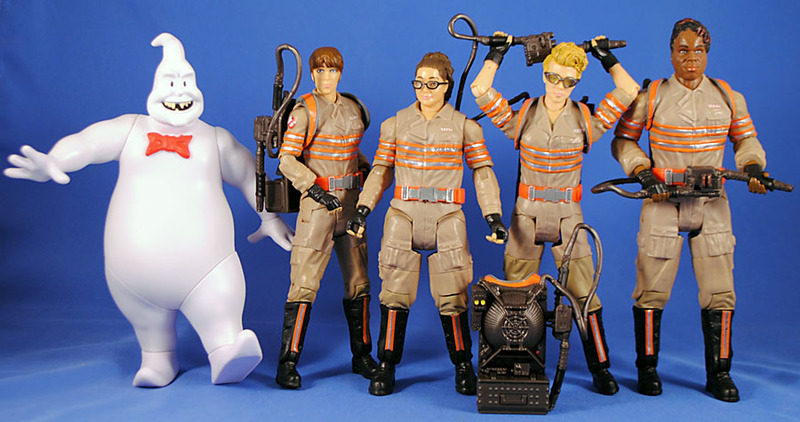 I just didn't have it in me to review the figures individually, especially since they are SO similar, so going in order of the photo, we have (left to right) Collect'n'Connect Rowan's Ghost, Erin Gilbert (Wiig), Abby Yates (McCarthy), Jillian Holtzman (McKinnon), and Patty Tolan (Jones). 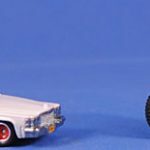 The paint and sculpts are just as basic and soft-in-detail as we've come to expect from Mattel. Seriously, what is with Mattel – they should be embarrassed calling these "Collector Figures" given what everyone else is putting out in the same scale, etc. I do actually dig the costumes from the new movie, they're different but similar enough and the reflective striping does seem like a good addition. But one does miss the visual break offered by at least the elbow pads on the classic suits. The articulation is... present but limited, a signature Mattel move. Similarly, the likenesses are passable, but conveyed mainly via hair or glasses. I appreciate that they gave all four women unique body tooling. The proton wands can be held or attached to the packs, and the packs are removable, which is nice. It would have been cool if they'd come with their unique accessories from the final battle or something, anything, to help the figures feel more different. They do come with a build-a-figure of Rowan's ghost (I actually did quite like Rowan as the villain and the set up for "why" ghosts were now appearing) and it's a good sculpt, but it's sooooo preposed that there is no point to the "articulation." 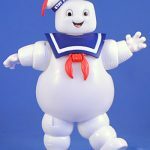 I really, really appreciate that they kept many of the ghosts in the new Ghostbusters movie as generally weird, cartoony demons rather than more traditional ghosts, just like in the original movies; but one of the weirdest choices was bringing back the Stay Puft man but as a Parade Balloon. It's kind of a clever thought at first, but why are there haunted balloons? Anyway, he was one of the three ghosts Mattel actually released from the film and he's an homage, so here we are. The sculpt is pretty nice and I like the rippling along the seams to further sell the idea that he's a balloon. The articulation on him actually pretty good, all things considered, and he does have a light up feature as well. Press the button on his neckerchief and his torso and head glow red... just like they don't in the movie. It's a novel figure. Since I really didn't like the new movie I held off on these but when Walmart had then on clearance for $2.50 I couldn't pass that up. For all of my issues with the film, I do actually dig the new Ecto-1. Using a hearse as the base vehicle is pretty obvious but cool looking and it looks good in the white and red, even if that doesn't make as much sense as it did when it was an ambulance. Maybe it's from growing up with the Real Ghostbusters cartoon but it always bummed me that there was never an Ecto-2 or 3 or so on, so I dig that there is one here. The motorcycle is a clever choice too but, like most things in the movie, it was only ever a plot device rather than something cool or useful to the job of busting ghosts. Mattel included a little black box here that rests under the motorcycle's engine as a sort of stand. It's a very welcome addition but it can be very easily overlooked as part of the packaging or even lost, so a kickstand would have been nicer. Still though, this is a very convenient set that gets me the two new vehicles for the movie in one fell swoop. 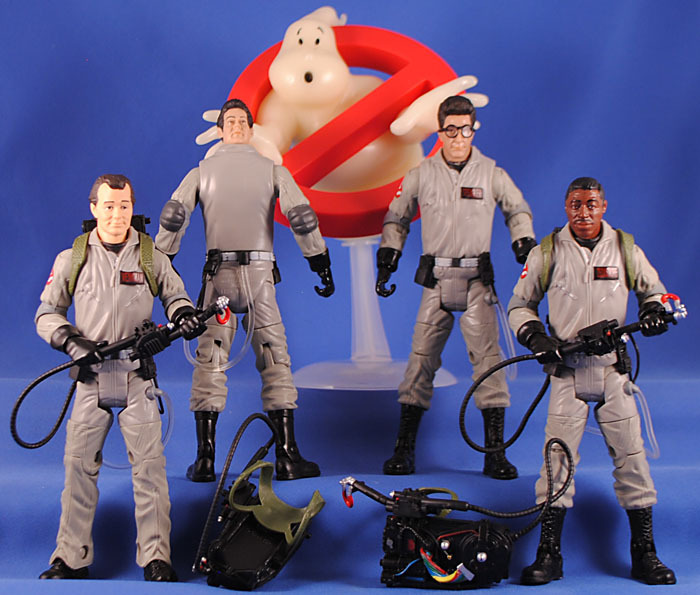 This entry was posted in Rustin's Spoils of the Week and tagged Ghostbusters. Bookmark the permalink. I found the DC Multiverse wave with DKR Wonder Woman at Five Below today and was rereading Yo’s reviews of those figures. Yo, try pushing your the head of your Dr Psycho figure down harder. My figure had a smaller indent than the ball joint on the neck but it stretched to fit after some shoving. My figures head fits lower on the neck now like it should and I suspect yours will too.